The following is an excerpt from the “GE Water Purification Handbook – Boiler Water Systems”, Chapter 11. It details corrosion prevention methods of the mild steel tanks used in boiler systems, though, the same chemistry should apply to other types of mild steel tanks. May it save you from enormous pain in your life. The establishment of protective metal oxide layers through the use of reducing agents (such as hydrazine, hydroquinone, and other oxygen scavengers) is known as metal passivation or metal conditioning. Although “metal passivation” refers to the direct reaction of the compound with the metal oxide and “metal conditioning” more broadly refers to the promotion of a protective surface, the two terms are frequently used interchangeably. Magnetite and cuprous oxide form protective films on the metal surface. Because these oxides are formed under reducing conditions, removal of the dissolved oxygen from boiler feedwater and condensate promotes their formation. The effective application of oxygen scavengers indirectly leads to passivated metal surfaces and less metal oxide transport to the boiler whether or not the scavenger reacts directly with the metal surface. A significant reduction in feedwater oxygen and metal oxides can occur with proper application of oxygen scavengers. Figure 11-8. 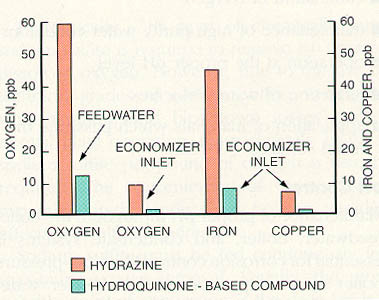 Feedwater oxygen, iron and copper levels show dramatic reduction when hydroquinone-based materials are used instead of hydrazine (data taken during start-ups and excursions). Protection of steel in a boiler system depends on temperature, pH, and oxygen content. 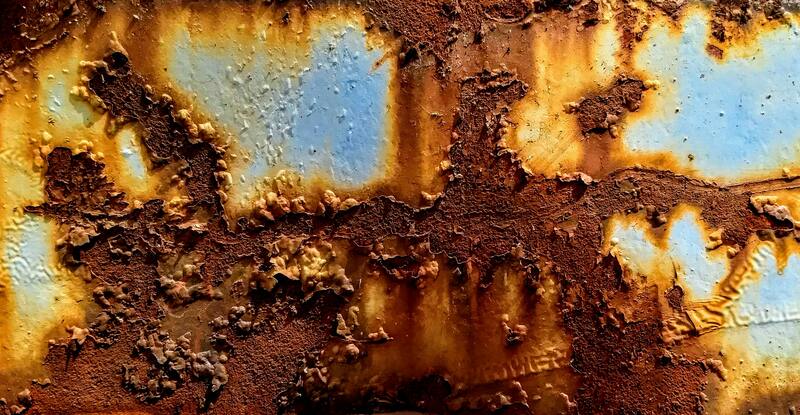 Generally, higher temperatures, high or low pH levels, and higher oxygen concentrations increase steel corrosion rates. Mechanical and operational factors, such as velocities, metal stresses, and severity of service can strongly influence corrosion rates. Systems vary in corrosion tendencies and should be evaluated individually. The impact of each of these factors varies depending on characteristics of each system. Temperature dependence results from faster reaction times and greater solubility of copper oxides at elevated temperatures. Maximum temperatures specified for various alloys range from 200 to 300°F. The pH or alkalinity level maintained in a boiler system depends on many factors, such as system pressure, system metals, feedwater quality, and type of chemical treatment applied. The corrosion rate of carbon steel at feedwater temperatures approaches a minimum value in the pH range of 9.2-9.6. (see Figure 11-9). It is important to monitor the feedwater system for corrosion by means of iron and copper testing. For systems with sodium zeolite or hot lime softened makeup, pH adjustment may not be necessary. In systems that use deionized water makeup, small amounts of caustic soda or neutralizing amines, such as morpholine and cyclohexylamine, can be used. Figure 11-9. Iron corrosion product release from carbon steel in boiler feedwater. 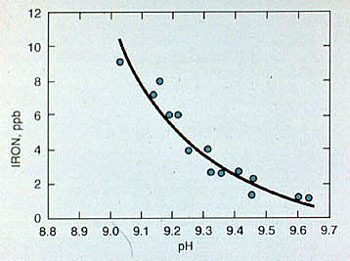 In the boiler, either high or low pH increases the corrosion rates of mild steel (see Figure 11-10). The pH or alkalinity that is maintained depends on the pressure, makeup water characteristics, chemical treatment, and other factors specific to the system. Figure 11-10. High or low boiler water pH corrodes boiler steel. The best pH for protection of copper alloys is somewhat lower than the optimum level for carbon steel. For systems that contain both metals, the condensate and feedwater pH is often maintained between 8.8 and 9.2 for corrosion protection of both metals. The optimum pH varies from system to system and depends on many factors, including the alloy used (see Figure 11-11). To elevate pH, neutralizing amines should be used instead of ammonia, which (especially in the presence of oxygen) accelerates copper alloy corrosion rates. Also, amines form protective films on copper oxide surfaces that inhibit corrosion. Chemical Oxygen Scavengers. The oxygen scavengers most commonly used in boiler systems are sodium sulfite, sodium bisulfite, hydrazine, catalyzed versions of the sulfites and hydrazine, and organic oxygen scavengers, such as hydroquinone and ascorbate. It is of critical importance to select and properly use the best chemical oxygen scavenger for a given system. Major factors that determine the best oxygen scavenger for a particular application include reaction speed, residence time in the system, operating temperature and pressure, and feedwater pH. Interferences with the scavenger/oxygen reaction, decomposition products, and reactions with metals in the system are also important factors. Other contributing factors include the use of feedwater for attemperation, the presence of economizers in the system, and the end use of the steam. Chemical oxygen scavengers should be fed to allow ample time for the scavenger/oxygen reaction to occur. The deaerator storage system and the feedwater storage tank are commonly used feed points. In boilers operating below 1,000 psig, sodium sulfite and a concentrated liquid solution of catalyzed sodium bisulfite are the most commonly used materials for chemical deaeration due to low cost and ease of handling and testing. Theoretically, 7.88 ppm of chemically pure sodium sulfite is required to remove 1.0 ppm of dissolved oxygen. However, due to the use of technical grades of sodium sulfite, combined with handling and blowdown losses during normal plant operation, approximately 10 lb of sodium sulfite per pound of oxygen is usually required. The concentration of excess sulfite maintained in the feedwater or boiler water also affects the sulfite requirement. Sodium sulfite must be fed continuously for maximum oxygen removal. Usually, the most suitable point of application is the drop leg between the deaerator and the storage compartment. Where hot process softeners are followed by hot zeolite units, an additional feed is recommended at the filter effluent of the hot process units (prior to the zeolite softeners) to protect the ion exchange resin and softener shells. As with any oxygen scavenging reaction, many factors affect the speed of the sulfite-oxygen reaction. These factors include temperature, pH, initial concentration of oxygen scavenger, initial concentration of dissolved oxygen, and catalytic or inhibiting effects. The most important factor is temperature. 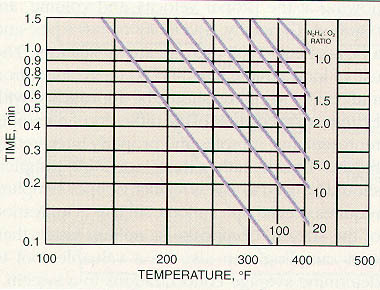 As temperature increases, reaction time decreases; in general, every 18°F increase in temperature doubles reaction speed. At temperatures of 212°F and above, the reaction is rapid. Overfeed of sodium sulfite also increases reaction rate. 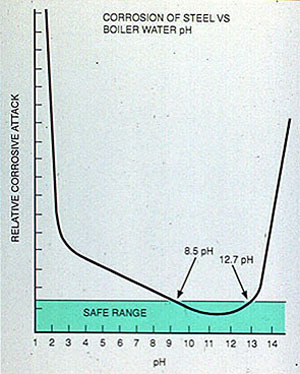 The reaction proceeds most rapidly at pH values in the range of 8.5-10.0. Certain materials catalyze the oxygen-sulfite reaction. The most effective catalysts are the heavy metal cations with valences of two or more. Iron, copper, cobalt, nickel, and manganese are among the more effective catalysts. Figure 11-12 compares the removal of oxygen using commercial sodium sulfite and a catalyzed sodium sulfite. Figure 11-12. 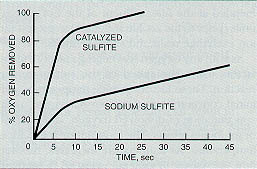 Comparison of the reaction rates of catalyzed sulfite and sodium sulfite with dissolved oxygen. After 25 seconds of contact, catalyzed sodium sulfite removed the oxygen completely. Uncatalyzed sodium sulfite removed less than 50% of the oxygen in this same time period. In a boiler feedwater system, this could result in severe corrosive attack. High feedwater sulfite residuals and pH values above 8.5 should be maintained in the feedwater to help protect the economizer from oxygen attack. Some natural waters contain materials that can inhibit the oxygen/sulfite reaction. For example, trace organic materials in a surface supply used for makeup water can reduce speed of scavenger/oxygen reaction time. The same problem can occur where contaminated condensate is used as a portion of the boiler feedwater. The organic materials complex metals (natural or formulated catalysts) and prevent them from increasing the rate of reaction. Sodium sulfite must be fed where it will not contaminate feedwater to be used for attemporation or desuperheating. This prevents the addition of solids to the steam. Because the products of this reaction are water and nitrogen, the reaction adds no solids to the boiler water. The decomposition products of hydrazine are ammonia and nitrogen. Decomposition begins at approximately 400°F and is rapid at 600°F. The alkaline ammonia does not attack steel. However, if enough ammonia and oxygen are present together, copper alloy corrosion increases. Close control of the hydrazine feed rate can limit the concentration of ammonia in the steam and minimize the danger of attack on copper-bearing alloys. The ammonia also neutralizes carbon dioxide and reduces the return line corrosion caused by carbon dioxide. Hydrazine is a toxic material and must be handled with extreme care. Because the material is a suspected carcinogen, federally published guidelines must be followed for handling and reporting. Because pure hydrazine has a low flash point, a 35% solution with a flash point of greater than 200°F is usually used. Theoretically, 1.0 ppm of hydrazine is required to react with 1.0 ppm of dissolved oxygen. However, in practice 1.5-2.0 parts of hydrazine are required per part of oxygen. The factors that influence the reaction time of sodium sulfite also apply to other oxygen scavengers. Figure 11-13 shows rate of reaction as a function of temperature and hydrazine concentration. The reaction is also dependent upon pH (the optimum pH range is 9.0-10.0). Figure 11-13. 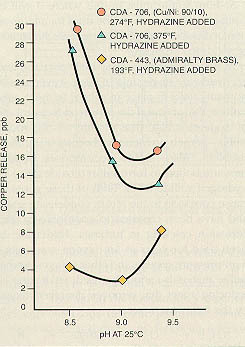 Time/temperature relationship for 90% oxygen removal by hydrazine at a pH of 9.5. Because hydrazine and organic scavengers add no solids to the steam, feedwater containing these materials is generally satisfactory for use as attemperating or desuperheating water. The major limiting factors of hydrazine use are its slow reaction time (particularly at low temperatures), ammonia formation, effects on copper-bearing alloys, and handling problems. Organic Oxygen Scavengers. Several organic compounds are used to remove dissolved oxygen from boiler feedwater and condensate. Among the most commonly used compounds are hydroquinone and ascorbate. These materials are less toxic than hydrazine and can be handled more safely. As with other oxygen scavengers, temperature, pH, initial dissolved oxygen concentration, catalytic effects, and scavenger concentration affect the rate of reaction with dissolved oxygen. When fed to the feedwater in excess of oxygen demand or when fed directly to the condensate, some organic oxygen scavengers carry forward to protect steam and condensate systems. Hydroquinone is unique in its ability to react quickly with dissolved oxygen, even at ambient temperature. As a result of this property, in ad-dition to its effectiveness in operating systems, hydroquinone is particularly effective for use in boiler storage and during system start-ups and shutdowns. It is also used widely in condensate systems. These reactions are not reversible under the alkaline conditions found in boiler feedwater and condensate systems. In fact, further oxidation and thermal degradation (in higher-pressure systems) leads to the final product of carbon dioxide. Intermediate products are low molecular weight organic compounds, such as acetates. Oxygen Level Monitoring. Oxygen monitoring provides the most effective means of controlling oxygen scavenger feed rates. Usually, a slight excess of scavenger is fed. Feedwater and boiler water residuals provide an indication of excess scavenger feed and verify chemical treatment feed rates. It is also necessary to test for iron and copper oxides in order to assess the effectiveness of the treatment program. Proper precautions must be taken in sampling for metal oxides to ensure representative samples. Due to volatility and decomposition, measurement of boiler residuals is not a reliable means of control. The amount of chemical fed should be recorded and compared with oxygen levels in the feedwater to provide a check on the control of dissolved oxygen in the system. With sodium sulfite, a drop in the chemical residual in the boiler water or a need to increase chemical feed may indicate a problem. Measures must be taken to determine the cause so that the problem can be corrected. Sulfite residual limits are a function of boiler operating pressure. For most low- and medium-pressure systems, sulfite residuals should be in excess of 20 ppm. Hydrazine control is usually based on a feedwater excess of 0.05-0.1 ppm. For different organic scavengers, residuals and tests vary. Appropriate monitoring techniques vary with different systems. Testing should be performed at least once per shift. Testing frequency may have to be increased for some systems where control is difficult, or during periods of more variable operating conditions. All monitoring data, whether spot sampling or continuous, should be recorded. Boiler feedwater hardness, iron, copper, oxygen, and pH should be measured. Both iron and copper, as well as oxygen, can be measured on a daily basis. It is recommended that, when possible, a continuous oxygen meter be installed in the feedwater system to detect oxygen intrusions. Iron and copper, in particular, should be measured with care due to possible problems of sample contamination. If a continuous oxygen meter is not installed, periodic testing with spot sampling ampoules should be used to evaluate deaerator performance and potential for oxygen contamination from pump seal water and other sources. It is critical to obtain representative samples in order to monitor conditions in the boiler feedwater system properly. Sample lines, continuously flowing at the proper velocity and volume, are required. Generally, a velocity of 5-6 ft/sec and a flow of 800-1000 mL/min are satisfactory. The use of long sample lines should be avoided. Iron and copper sampling should be approached with extreme care because of the difficulty of obtaining representative samples and properly interpreting results. Trends, rather than individual samples, should be used to assess results. Copper sampling requires special precautions, such as acidification of the stream. Composite sampling, rather than spot sampling, can also be a valuable tool to determine average concentrations in a system. Oxygen sampling should be performed as close to the line as possible, because long residence time in sampling lines can allow the oxygen scavenger to further react and reduce oxygen readings. Also, if in-leakage occurs, falsely high data may be obtained. Sampling for oxygen should also be done at both the effluent of the deaerator and effluent of the boiler feedwater pump, to verify that oxygen ingress is not occurring. All inspections of equipment should be thorough and well documented. Conditions noted must be compared to data from previous inspections. Analytical results and procedures must be evaluated to ensure that quality standards are maintained and that steps are taken for continual improvement. 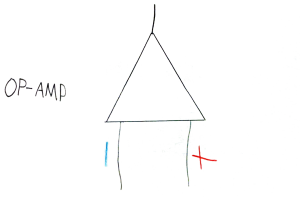 Cause-and-effect diagrams(see Figure 11-14) can be used either to verify that all potential causes of problems are reviewed, or to troubleshoot a particular corrosion-related problem. Figure 11-14. 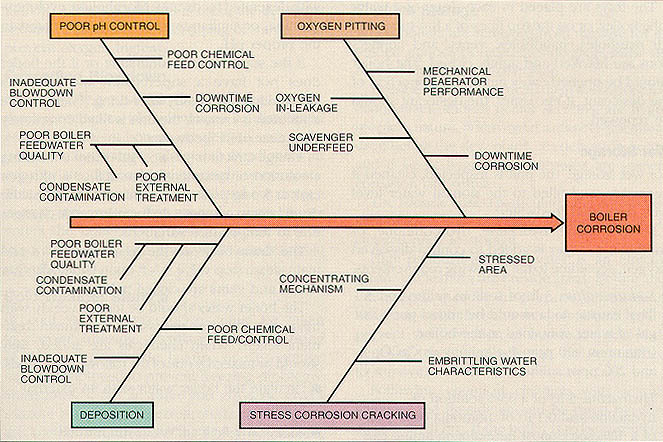 Boiler corrosion cause-and-effect diagram shows major types and causes of corrosion. Oxygen corrosion in boiler feedwater systems can occur during start-up and shutdown and while the boiler system is on standby or in storage, if proper procedures are not followed. Systems must be stored properly to prevent corrosion damage, which can occur in a matter of hours in the absence of proper lay-up procedures. Both the water/steam side and the fireside are subject to downtime corrosion and must be protected. Off-line boiler corrosion is usually caused by oxygen in-leakage. Low pH causes further corrosion. Low pH can result when oxygen reacts with iron to form hydroferric acid. This corrosion product, an acidic form of iron, forms at water-air interfaces. Corrosion also occurs in boiler feedwater and condensate systems. Corrosion products generated both in the preboiler section and the boiler may deposit on critical heat transfer surfaces of the boiler during operation and increase the potential for localized corrosion or overheating. The degree and speed of surface corrosion depend on the condition of the metal. If a boiler contains a light surface coating of boiler sludge, surfaces are less likely to be attacked because they are not fully exposed to oxygen-laden water. Experience has indicated that with the improved cleanliness of internal boiler surfaces, more attention must be given to protection from oxygen attack during storage. Boilers that are idle even for short time periods (e.g., weekends) are susceptible to attack. Boilers that use undeaerated water during start-up and during their removal from service can be severely damaged. The damage takes the form of oxygen pitting scattered at random over the metal surfaces. Damage due to these practices may not be noticed for many years after installation of the unit. The choice of storage methods depends on the length of downtime expected and the boiler complexity. If the boiler is to be out of service for a month or more, dry storage may be preferable. Wet storage is usually suitable for shorter down-time periods or if the unit may be required to go on-line quickly. Large boilers with complex circuits are difficult to dry, so they should be stored by one of the wet storage methods. For dry storage, the boiler is drained, cleaned, and dried completely. All horizontal and non-drainable boiler and superheater tubes must be blown dry with compressed gas. Particular care should be taken to purge water from long horizontal tubes, especially if they have bowed slightly. Heat is applied to optimize drying. After drying, the unit is closed to minimize air circulation. Heaters should be installed as needed to maintain the temperature of all surfaces above the dew point. The trays are placed in each drum of a water tube boiler, or on the top flues of a fire-tube unit. All manholes, handholes, vents, and connections are blanked and tightly closed. The boiler should be opened every month for inspection of the desiccant. If necessary, the desiccant should be renewed. For wet storage, the unit is inspected, cleaned if necessary, and filled to the normal water level with deaerated feedwater. Sodium sulfite. 3 lb of sodium sulfite and 3 lb of caustic soda should be added per 1000 gal of water contained in the boiler (minimum 400 ppm P-alkalinity as CaCO3 and 200 ppm sulfite as SO3). Hydrazine. 5 lb of a 35% solution of hydrazine and 0.1 lb of ammonia or 2-3 lb of a 40% solution of neutralizing amine can be added per 1000 gal (minimum 200 ppm hydrazine and 10.0 pH). Due to the handling problems of hydrazine, organic oxygen scavengers are normally recommended. Hydroquinone. Hydroquinone-based materials are added to achieve approximately 200 ppm as hydroquinone in previously passivated on-line systems. In new systems, or those considered to have a poorly formed magnetite film, the minimum feed rate is 400 ppm as hydroquinone. pH should be maintained at 10.0. No matter which treatment is used, pH or alkalinity adjustment to minimum levels is required. After chemical addition, with vents open, heat is applied to boil the water for approximately 1 hr. The boiler must be checked for proper concentration of chemicals, and adjustments made as soon as possible. If the boiler is equipped with a nondrainable superheater, the superheater is filled with high-quality condensate or demineralized water and treated with a volatile oxygen scavenger and pH control agent. The normal method of filling nondrainable superheaters is by back-filling and discharging into the boiler. After the superheater is filled, the boiler should be filled completely with deaerated feedwater. Morpholine, cyclohexylamine, or similar amines are used to maintain the proper pH. If the superheater is drainable or if the boiler does not have a superheater, the boiler is allowed to cool slightly after firing. Then, before a vacuum is created, the unit is filled completely with deaerated feedwater. A surge tank (such as a 55-gal drum) containing a solution of treatment chemicals or a nitrogen tank at 5 psig pressure is connected to the steam drum vent to compensate for volumetric changes due to temperature variations. The drain between the nonreturn valve and main steam stop valve is left open wide. All other drains and vents are closed tightly. If the steaming method is used, the boiler should subsequently be filled completely, in keeping with the above recommendations. Although no other treatment is required, standard levels of the chemical treatment used when the boiler is operating can be present. Boilers can be protected with nitrogen or another inert gas. A slightly positive nitrogen (or other inert gas) pressure should be maintained after the boiler has been filled to the operating level with deaerated feedwater. The tube side of a feedwater heater is treated in the same way the boiler is treated during storage. The shell side can be steam blanketed or flooded with treated condensate. All steel systems can use the same chemical concentrations recommended for wet storage. Copper alloy systems can be treated with half the amount of oxygen scavenger, with pH controlled to 9.5. Deaerators are usually steam or nitrogen blanketed; however, they can be flooded with a lay-up solution as recommended for wet lay-up of boilers. If the wet method is used, the deaerator should be pressurized with 5 psig of nitrogen to prevent oxygen ingress. For effective yet simple boiler storage, clean, warm, continuous blowdown can be distributed into a convenient bottom connection on an idle boiler. Excess water is allowed to overflow to an appropriate disposal site through open vents. This method decreases the potential for oxygen ingress and ensures that properly treated water enters the boiler. This method should not be used for boilers equipped with nondrainable superheaters. In cold weather, precautions must be taken to prevent freezing. Auxiliary heat, light firing of the boiler, cascade lay-up, or dry storage may be employed to prevent freezing problems. Sometimes, a 50/50 water and ethylene glycol mixture is used for freeze protection. However, this method requires that the boiler be drained, flushed, and filled with fresh feedwater prior to start-up. The disposal of lay-up chemicals must be in compliance with applicable federal, state, and local regulations. When boilers are removed from the line for extended periods of time, fireside areas must also be protected against corrosion. Fireside deposits, particularly in the convection, economizer, and air heater sections, are hygroscopic in nature. When metal surface temperatures drop below the dew point, condensation occurs, and if acidic hygroscopic deposits are present, corrosion can result. The fireside areas (particularly the convection, economizer, and air heater sections) should be cleaned prior to storage. High-pressure alkaline water is an effective means of cleaning the fireside areas. Before alkaline water is used for this purpose, a rinse should be made with fresh water of neutral pH to prevent the formation of hydroxide gels in the deposits (these deposits can be very difficult to remove). Following chemical cleaning with a water solution, the fireside should be dried by warm air or a small fire. If the boiler is to be completely closed up, silica gel or lime can be used to absorb any water of condensation. As an alternative, metal surfaces can be sprayed or wiped with a light oil. If the fireside is to be left open, the metal sur-faces must be maintained above the dew point by circulation of warm air.